Scientists have made a groundbreaking discovery of a plume of water on Jupiter’s moon Europa, hidden in decades-old data from NASA’s Galileo spacecraft. And it could have important implications in the search for life. In a paper published in Nature Astronomy, a team led by Xianzhe Jia from the University of Michigan described how they re-analyzed data from the Galileo mission, which orbited Jupiter from 1995 to 2003. And they found that on December 16, 1997 the spacecraft appears to have flown straight through a plume on Europa, which may have been ejected from a suspected ocean beneath its icy surface. This corroborates with previous findings from the Hubble Space Telescope that suggests Europa is ejecting plumes. During this flyby (called E12) the spacecraft flew past Europa at an altitude of about 125 miles (200 kilometers). The data shows that two of its instruments measured a spike in the magnetic field and plasma density for about three minutes. This spike is thought to be consistent with a plume coming from the moon. As the water was ejected out from the surface, it would have droplets and material ranging in size from molecules to dust grains. These become ionized as they travel into space, turning into charged particles known as plasma. Plasma is also able to affect the magnetic field, meaning that Galileo could make two detections of this incoming plume of material from its two instruments. With a computer simulation, the team was able to show that the spikes they saw were most likely the result of a plume. And they could even work out its size. When the detection was first made, scientists had been unsure what they were seeing. It wasn’t until years later that we spotted plumes on Saturn’s moon Enceladus, and Hubble did not spot Europa’s plumes until the 2010s. So such an idea was very new. From all the Galileo flybys, this appears to be the only one where it flew through a plume. Another, E26 on January 3, 2000 at a height of 400 kilometers (250 miles), did also see a spike. But it lasted just seconds, with the team suggesting this was probably not the result of a plume. One of the most intriguing things about the E12 flyby is the location of the suspected plume. The team thinks it was coming from a region near a big crater on Europa called Pwyll Crater, which is just south of the moon’s equator. And this is a similar region to where Hubble saw its plumes before. This suggests there is some sort of “thermal anomaly” in this area, notes Jia, from which Europa is emitting plumes. It’s unclear at the moment how continuous this process is, though, and that could be vital to scientists on two upcoming missions. Some see Enceladus as a better bet for the search for life, as its plumes from its south pole appear to be continuous. While that case can be argued, the fact remains there are two upcoming missions planned for Europa, and none for Enceladus. In the early 2020s, NASA is planning to send a mission to Europa called the Europa Clipper. This will perform 45 flybys of the moon, many of which will be below that of Galileo’s E12 pass. If there are plumes there, and with its instrumentation on board, Clipper could directly sample them. An ESA mission, too, is heading to Europa. Called the Jupiter Icy Moons Explorer (JUICE), it’s intended to launch in 2022. Again, it has the instruments necessary to directly sample any plumes that are present on Europa. We do of course already have a spacecraft in orbit around Jupiter, NASA's Juno spacecraft, but that mission is currently orbiting over the poles of the gas giant and can't study Europa. It's unclear at the moment if that could change in future. Europa’s ocean beneath its surface is thought to be vast, with perhaps more water than there is on Earth. Accessing it is difficult, however, as the moon is encased in an icy crust that’s tens of kilometers thick. These plumes provide a way to directly sample the ocean beneath without burying beneath the surface. Although their exact process of formation is unclear, it’s thought cracks in the surface can open up and release bursts of water into space. And that has all kinds of crazy implications. 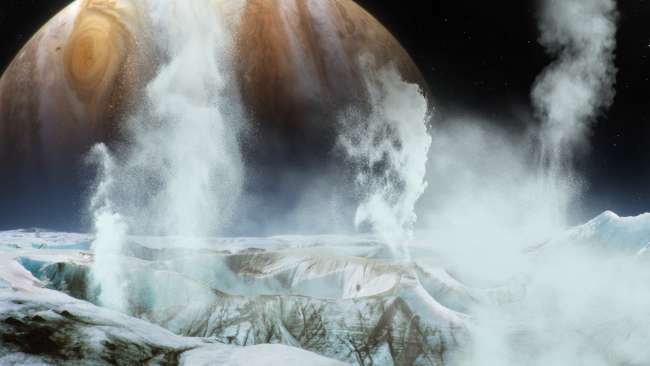 Because the interior of Europa, and other icy moons like it, may contain the necessary ingredients for life, including water and energy in the form of heat. If they have hydrothermal vents at their ocean floor, as some suggest, then these could be prime locations for life to arise. “The obvious science you can do is you have a way of measuring the composition in that plume, because that certainly is going to be interesting to know whether the ingredients for life are in the water that’s coming out from those plumes,” said Kurth.